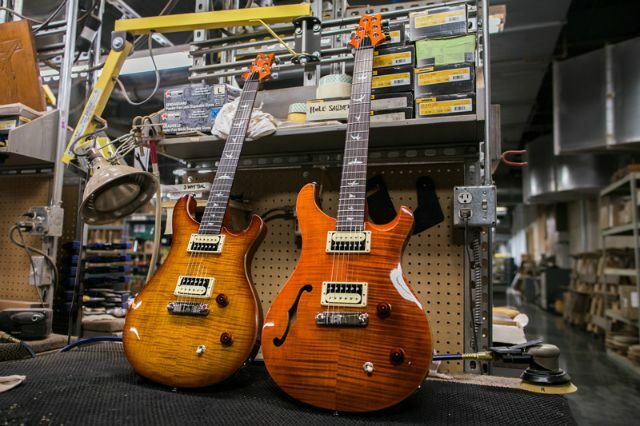 The PRS SE Custom 22 adds a more vintage tone and feel to the traditional SE Custom platform. This guitar has a pronounced mid-range and clarity that provides a sweet, full tonal bass and shimmering treble, allowing it to easily sit in a live band mix or recording. Like its 24-fret brother, the SE Custom 22 sports a maple top with mahogany back and 25" scale length. Additional appointments include dual humbuckers with a volume, tone, and 3-way toggle switch and a PRS-designed stoptail bridge. The SE Custom 22 is available in Vintage Sunburst and Whale Blue finishes. The PRS SE Custom 22 Semi-Hollow has musical midrange and outstanding resonance. The semi-hollow body provides an airy, sweet tone but with a twist of the tone knob, the dual humbuckers can get plenty of bright spank. Additional appointments include a maple top with a single F-Hole and flame maple veneer, chambered mahogany back, mahogany neck, rosewood fretboard, and dual humbuckers with a volume, tone, and 3-way toggle electronics configuration. The SE Custom 22 Semi-Hollow is both versatile and comfortable, making it a reliable tool for professionals, a solid choice for beginners, and a welcome addition to any arsenal.